Parks’ 3 Tots Gift Sets make an excellent choice for relatives and loved ones you truly wish to spoil. Each is a set of three premium-quality aromatherapy grade candles, hand poured into lovely glass votive mini vases, and carefully packed into a presentation quality gift box. Every ‘tot’ sized candle will burn for approximately eight hours of continuous use, and will do a wonderful job enlivening the atmosphere of most spaces after only a few minutes. Each tot has, at its core, one of our premium smokeless wicks, ensuring an even, soot-free flame that will never smoke or flicker. Around that is our proprietary blend of premium soot-free waxes, carefully formulated to provide a clean, scent-neutral burning experience. These are then infused with 100% lime, basil and mandarin orange essential oils, and poured by hand in small, artisanal batches. Upon receiving a Parks Lime, Basil and Mandarin 3 Tots Gift set, the first scent most people notice is mandarin orange. Its joyful piquancy practically leaps from the box even before it is opened. It also carries the spicy tones of lime and the subtleties of the basil forth quite well. Basil is the scent of so many fine foods, but to aromatherapists it is a stimulating fragrance that awakens the fatigued and enlivens those already wide awake. The essential oil of lime is also thought to have tonic properties, while its clear, piquant citrus notes blend perfectly with mandarin’s sweeter scent. 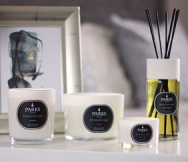 All three together become a subtle, exciting and purifying scent which improves any space.